A WhatsApp chat of Anas, one of the 10 suspects arrested on Thursday, revealed the details about the plan. New Delhi: The ISIS-inspired terror module was reportedly planning to carry out a fidayeen attack at Ram Janmabhoomi in Ayodhya district of Uttar Pradesh on December 29, sources claimed on Friday. A WhatsApp chat of Anas, one of the 10 suspects arrested on Thursday, revealed the details about the plan. 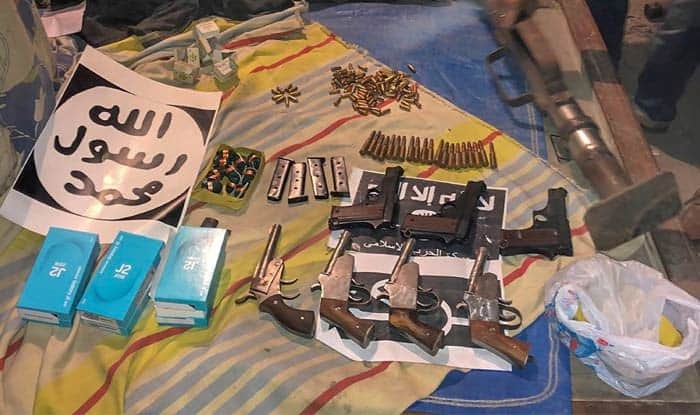 The National Investigation Agency (NIA) on Wednesday busted ISIS-inspired terror module and arrested 10 suspects, who it said were planning suicide attacks and serial blasts targeting politicians and government installations in Delhi and other parts of north India. The development came a month before Republic Day celebrations on January 26 when security is heightened across India, particularly in the national capital. The searches were carried out in coordination with Special cell of Delhi Police and Anti Terrorist Squad (ATS) of Uttar Pradesh Police at 6 places in Delhi’s Jafrabad and Seelampur, and 11 places in Uttar Pradesh (6 in Amroha, 2 in Lucknow, 2 in Hapur and 1 in Meerut). A locally made rocket launcher, material for suicide vests and 100 alarm clocks to be used as timers were recovered from the searches. Those arrested include the alleged mastermind, 29-year Mohammed Suhail, a ‘mufti’, or a Muslim legal expert empowered to give rulings on religious matters, from Amroha in western Uttar Pradesh, an engineering student in a private university in Noida and a third year graduation student in humanities as well as two welders. During the raids, the agency found a video where Suhail is demonstrating the method to complete a bomb circuit. The video has been shot at his residence only. A total of 12 country made pistols, 150 rounds of live ammunition, a country-made rocket launcher, 112 alarm clocks, mobile phone circuits, batteries and 51 pipes to be used as pipe bombs were recovered. In addition, the agency recovered 25 kg of explosive material–Potassium Nitrate, Ammonium Nitrate, Sulphur etc. The group had also purchased remote control cars and wireless doorbells to use their circuits in assembling remote controlled improvised explosive devices. Steel containers, electric wires, 91 mobile phones, 134 SIM cards, 3 laptops, knife, sword, ISIS-related literature and a cash amount of about Rs. 7.5 lakh were recovered by the NIA during the searches.